The documentary film Waiting for Superman debuted on September 24, 2010. To date it has only grossed $2.7 million at the box office. 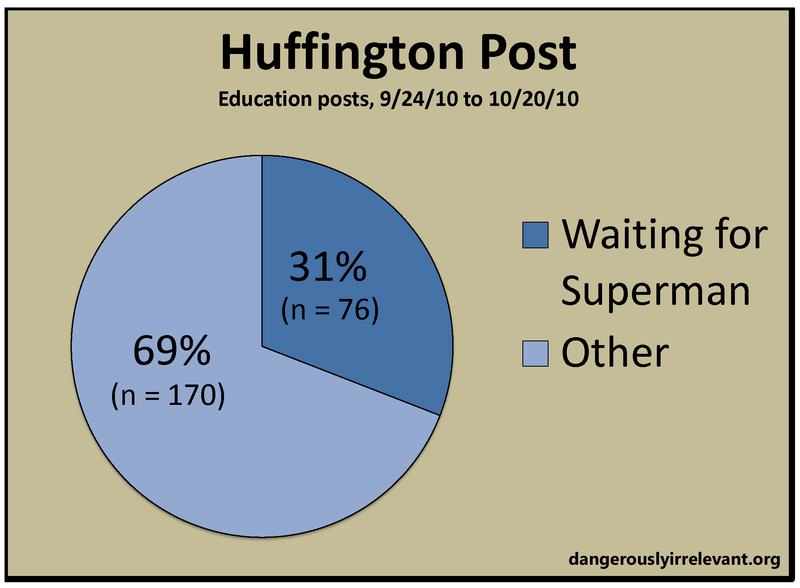 Just in case you were wondering, however, between September 24 and October 20 there have been 246 posts made in the Huffington Post Education section. Of those posts, 76 of them (31%) have referenced the film in one way, shape, or form. The percentage of celebrity and/or politician posts at HuffPo that have referenced the film? Much, much higher. A Google search brings up nearly 25 million results. In contrast, a search for NBC's recent Education Nation series only brings up about 120,000. What do you think is going on here? An outsized impact for a small documentary?